I recently wrote about Gmail as the Notepad of the Web. Well today I discovered another component of the self-assembling Web OS: the Start button, made possible by del.icio.us and the Foxylicious (Firefox+del.icio.us) Firefox extension. (If you don't already know, del.icio.us is a wonderful web-based bookmark manager). The Web OS is coming together indeed. We have our Notepad. We have our Start Menu. Email client. Usenet newsreader. Photo organizer. RSS reader. Word processor. Registry. Hard disk. What's the next desktop application to move onto the web? posted by Jonathan at 4/01/2005 11:01:00 p.m.
good tip, thanks. This changes the way I think about the programs I use on the web. Really. By Hashim, at 4/20/2005 10:15 p.m.
Hi Hashim - Computing's come a long way since BBS's and floppies, hey? By Jonathan, at 4/21/2005 9:31 p.m.
Great article. I don't know how you managed to get a folder into the taskbar though, it doesn't work for me. By Anonymous, at 5/04/2005 12:36 p.m.
* Click Bookmarks > Manage Bookmarks. * Click New Folder, type in "start", and press OK.
* Drag the "start" folder into the "Bookmarks Toolbar" folder. * Close the Bookmarks Manager window. The "start" folder will appear in your Bookmarks Toolbar. * Click View > Toolbars > Customize. 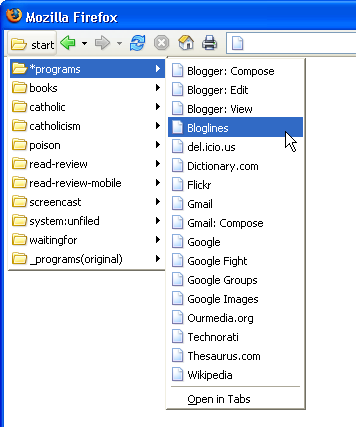 * Drag the Bookmarks Toolbar up into the main Firefox toolbar. * Close the Customize Toolbar window. * Remove the space reserved for the Bookmarks Toolbar by clicking View > Toolbars > Bookmarks Toolbar. By Jonathan, at 5/04/2005 2:06 p.m.
By Anonymous, at 5/05/2005 2:36 a.m.
My pleasure! I'm glad you checked back. By Jonathan, at 5/05/2005 8:11 a.m.